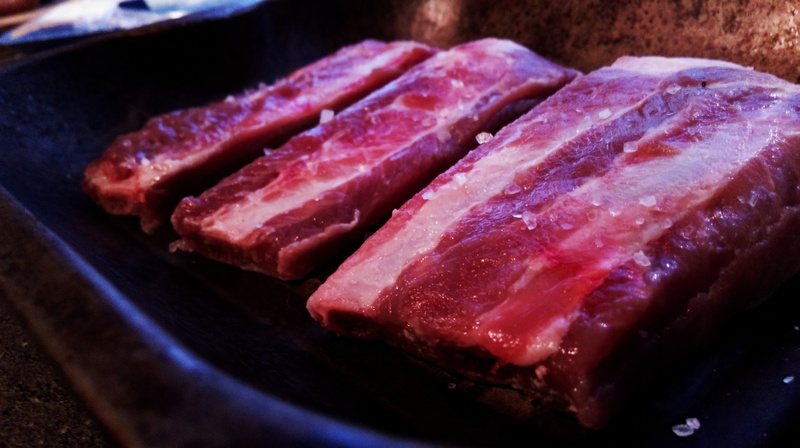 Starter or main, ribs are fantastic base for any meal. Sadly, we’ve pushed them into two distinct boxes – Chinese and Barbecue. The rib-meat itself is so adaptable it’s a terrible shame to not experiment every now and then. Mango Salsa has exploded in popularity recently, and pork goes so well with fruity sweet flavours it was a no brainer for me! Of course, the chili is optional and adaptable, but the it’s such a shame to miss that bite! 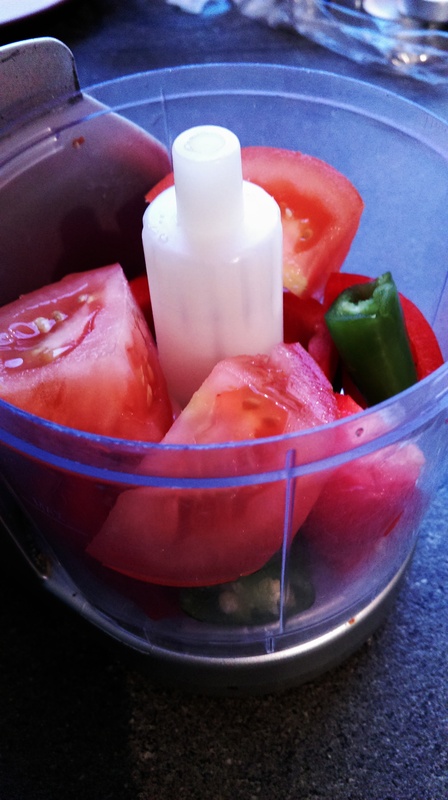 Using a food processor, a chopper or your own two hands (and a knife), finely chop all the tomato, pepper and chili. 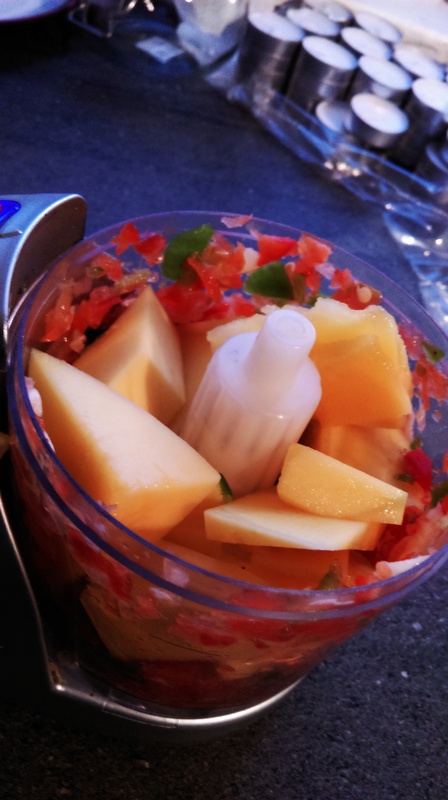 You want the Mango to comprise about 50% of the total volume of the salsa, so put in as much as necessary, just as finely chopped. 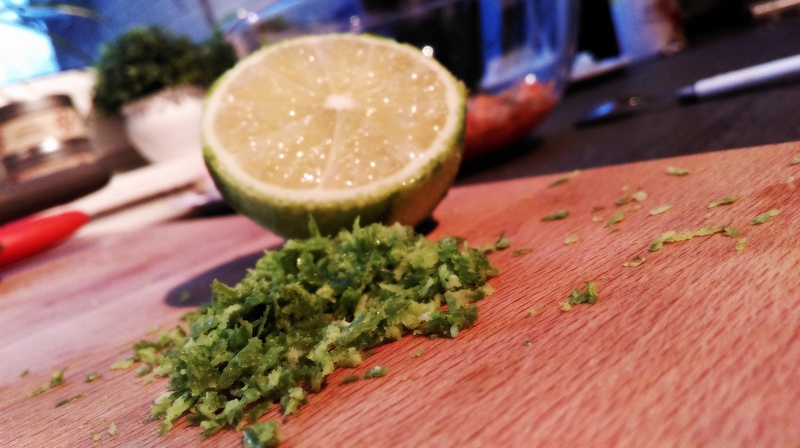 Season and adjust the salsa with the Lime juice, Lime Zest, Vinegar, Cumin, Salt, Pepper and Honey/Sugar. 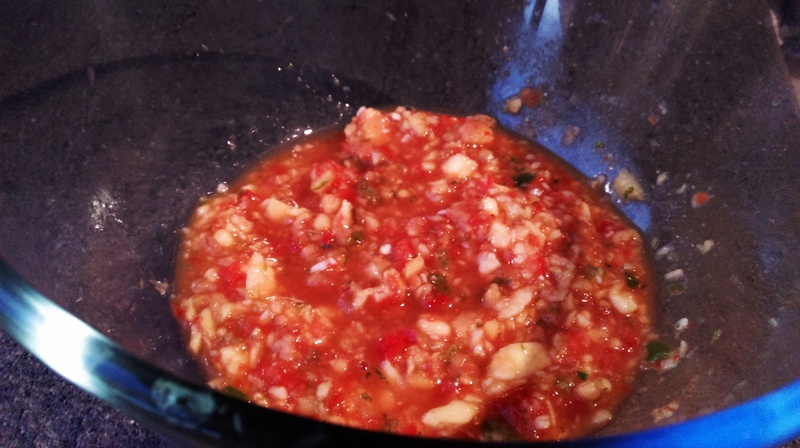 You want a fairly wet salsa, as it will keep the ribs moist, and will itself thicken/reduce in the oven. You want a fairly sweet mixture and for the mango to stand out. Spiciness is, of course, down to you. I like to cut the ribs fairly small – this is particularly good for sharing, but it also ensures you can cover more of the meat with the delicious fruity flavours. 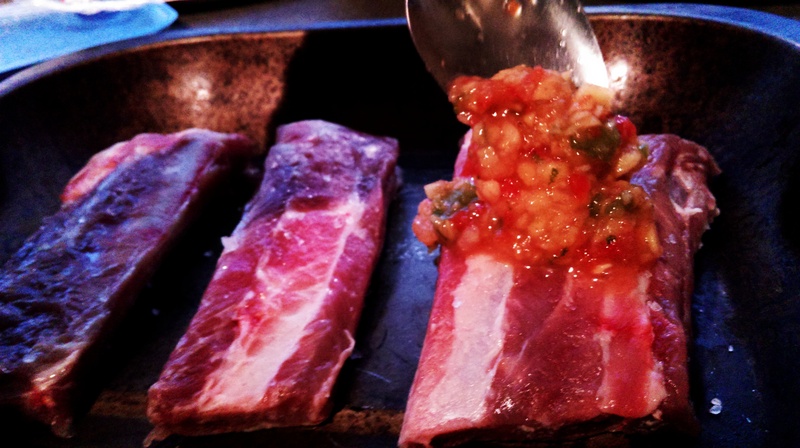 Place the ribs on a baking tray and cover with the salsa. 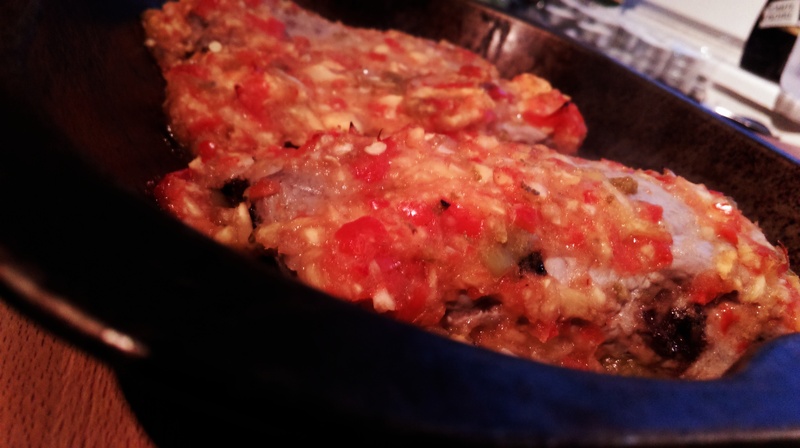 Bake in the oven for around 25 minutes, turning and re-covering with the salsa every now and then. Finish off by grilling until the top begins to brown, but do make sure they don’t dry. Ultimately, when they’re done is down to you! 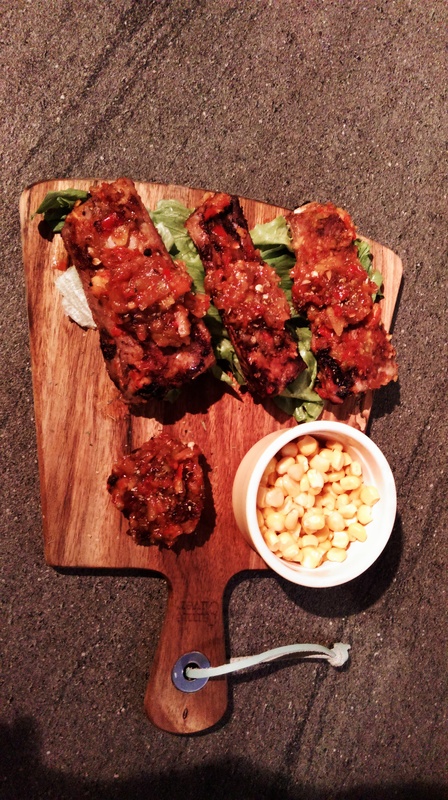 Serve with large dollops of the cooked salsa on top of each rib, maybe even with a bit on the side! As part of a meal, this would be great with Coconut Rice. For myself, just a little bit of Corn and salad was more than enough! Once cooked, these are definitely best eaten immediately – they will just dry out the longer you leave them, and it’s tough to reheat effectively. Got any other great uses of Ribs? Let us know in the comments below! Posted in Guesscipes, Mains, Pork, StartersTagged chili, food, guesscipe, hot, mango, pork, recipe, ribs, salsa, spicy, spicy ribs, sweetBookmark the permalink.